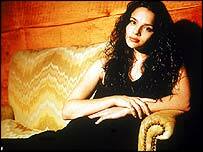 Jazz singer Norah Jones has won eight Grammy awards - just two years after signing with jazz label Blue Note. The 23-year-old is now one of the US music industry's biggest stars, and her smoky voice and down-to-earth nature have won her a legion of fans. The daughter of legendary Indian performer Ravi Shankar, Jones was born in New York, but moved with her mother Sue to the Dallas, Texas suburb of Grapevine aged four. She began singing aged five, inspired by her mother's love of Billie Holliday. "I picked out one disc that I liked and played that over and over again," she later recalled. "You Go To My Head, that was my favourite." When Jones was 15, she moved with her mother into the centre of Dallas, where she studied the piano at Booker T Washington High School for the Performing and Visual Arts - whose alumni include Erykah Badu and trumpeter Roy Hargrove. She played her first gig at a local coffee house on her 16th birthday, and won student music awards for her singing, before joining a band called Laszlo, playing "dark, jazzy rock". She studied jazz piano at the University of North Texas, but after two years, in 1999, took a summer trip to Manhattan. There, she became hooked on the music scene, and stayed in New York, deciding not to return to her course. "The music scene is so huge, I found it very exciting," she said. "I especially enjoyed hearing amazing songwriters at places like The Living Room. Everything opened up for me, I couldn't leave." For a time, she performed with groove-based band Wax Poetic, and during 2000 she assembled her own group with local songwriter Jesse Harris and Lee Alexander. Jones sang and played piano. That October, they made a demo for legendary jazz label Blue Note, and on the strength of those recordings and a live showcase, Jones was signed three months later. Blue Note president Bruce Lundvall said: "She sings like and angel and plays the piano like her fingers are feathers." Early recording sessions were dumped as sounding too cluttered and guitar-based. But a new set with producer and arranger Arif Mardin, which put more emphasis on Jones' voice, was the one which made it onto her debut album Come Away With Me, released in February 2002. Blue Note was unsure whether or not the record would fit in its jazz portfolio - but stuck with it, which Jones credits her with easing her away from commercial pressures. "You don't ever have to sell a million records to be successful in their books," she said. "Sell 50,000 and you can make another record." Now the accolades are rolling in. In November 2002 she featured on the cover of the US edition of Vanity Fair alongside big name performers Alicia Keys, Sheryl Crow, Gwen Stefani and Jennifer Lopez. "I never thought I'd have a record like this - I thought it would be at least five years before I'd reach that point. This is really the record I wanted to make," she said of her debut. Now, after a triumphant night at the Grammys, it will be surprising if Jones ever does return to North Texas to finish the course she abandoned just over three years ago.